The Created vs. 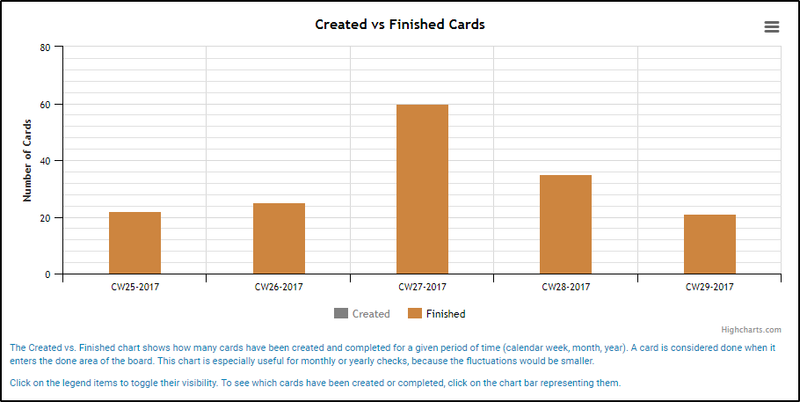 Finished chart shows how many cards have been created (blue graph bars) and completed (brown graph bars) for a given period of time (calendar week, month, year). A card is considered completed when it enters the "Done" section of the board. The aim of the chart is to compare the throughput you and your team are receiving compared to the output that you are able to provide. This allows you to understand at a glance whether your team needs additional support or it is working on a lower capacity than it could. * For a better view, right click on the image and open it in a new browser tab. From the Filter Data panel on the left side of the graph, you can define a custom time range and visualize it by days, weeks, months and even years. Sometimes cards are created on one board, but very often a runtime policy is triggered and they are moved to another board as per the working process (e.g. by a runtime policy or manually). If you checkmark "Hide cards created in other boards" you can filter out only those cards created on the current board. 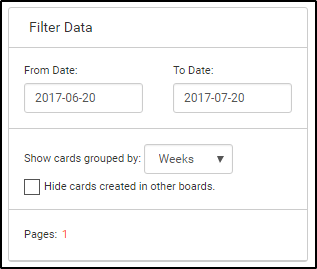 You can additionally filter your data by assignee, priority and other attributes like tag, size, card type, color and custom fields. Click on the legend items to toggle the visibility of the graph bars. When you click on a graph bar a list of all cards opens below the graph. From here you can open a card to check its details or quick search for a card from the Filter field. The chart context menu on the right side of the graph allows you to print the chart, download it as a PNG or SVG vector image or as a PDF file.